WHY A FIELD NOTEBOOK? 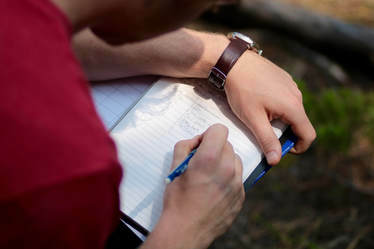 A field notebook is used to record the day-to-day details of fieldwork. Field notes are used to complete reporting forms, write a final report, and document spatial details of a site that will be used to create the sketch map in ArcMap. A scanned copy of your field notebook is accessioned into the fieldwork data archive at the end of the block. 1. On the inside cover: Write your name and phone number (so your notebook can be returned to you if lost) and write the project name/s and number/s documented in the notebook. Example: To locate, identify, record, and evaluate all cultural resources within the project area. To contribute to cultural resource databases of the USFS and OAHP to facilitate land management decisions. To generate data-informed information and interpretations about past human action in the forest. To identify specific site characteristics including spatial limits, topographic setting, inferred activities, and temporal affiliations. To identify and synthesize land use patterns relating to past settlement and resource utilization). Example: What were the primary human activities in the MEF, ca. 1850 to 1950? Expected results (kind, number, location, character, and condition of cultural resources based on existing context documents and background research on the area). Example: We expect to identify historic period human activities including mining, logging, homesteading, grazing, and recreation. Features and artifacts associated with these land uses include abandoned historic mines, shafts, adits, mining-related infrastructure, vernacular cabins, and homesteading-related structures. Artifacts expected are associated with each activity including associated debris and artifact scatters. ​Example: A Final Report conforming to the Colorado Cultural Resource Survey Manual, completed site forms for all cultural resources documented, a public presentation of results to stakeholders. Field survey conditions (visibility, weather, heavy undergrowth, steep terrain, etc.). These are the factors that affected our field work. land use patterns (visible human impacts): fire, cultivation, grazing, recreation, etc. use SMITH numbers (or agreed upon temporary number) and UTM coordinates (northing, easting, and datum used). CRITICAL! Create a sketch map of each site encountered. A GPS device will only capture points, lines, polygons. More detail is needed to document a site, such as washes, ditches, slopes, trails etc. that will not show up on base maps but will affect the deposition and formation processes of the archaeological record. Please write legibly as you will need to scan the notes and submit them to the archive of our field work for future researchers. Exceeds Expectations: The field notebook is consistently thorough, accurate, legible, and easily understood by any worker familiar with field research. Each day in the field is thoroughly documented. The quality of the entries are consistently high throughout the notebook. Information is relevant, or possibly relevant, to a thorough understanding and reconstruction of the work and the investigation. Does Not Meet Expectations: The field notebook is not consistently thorough, accurate, legible, and easily understood by any worker familiar with field research. Most days in the field are documented. The quality of the entries is uneven and appear as an afterthought, completed in haste. Information is occasionally relevant to a thorough understanding and reconstruction of the work and the investigation. However, the notes cannot be trusted as a source of reliable information about the field work.